In response to the challenge by new Arab-Islamic fleets, a more powerful Romano-Byzantine navy would emerge in the late 7th century. The 'Battle of the Masts' would not be the last naval encounter between these two rivals. Indeed, later Byzantine attempts to retake Egypt would convince Mu'awiya, the governor of Syria and subsequently the first Umayyad Caliph, of the need for a full Islamic navy in the Mediterranean. 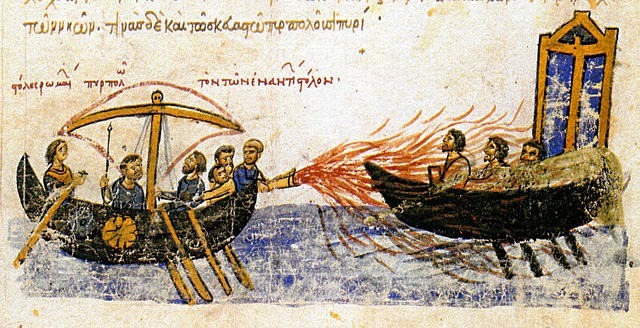 By the mid-8th century such galleys defended themselves against the terrifying Byzantine incendiary weapon known as 'Greek fire' using various systems of water-soaked cotton, and would shortly use Greek fire themselves. However, the vessels of the rival naval powers remained remarkably similar, as there was an exchange of both technology and terminology between them. 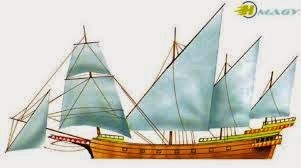 • One bergantim (brigantine), a smaller, two-masted vessel with a square sail on the foremast and lateen-rigged on the other. At this time period, it was probably also equipped with oars. Later generations of Europeans, from the seventeenth century on, would grow increasingly confident, even complacent, regarding their military superiority over the East (excepting such scares as the 1683 siege of Vienna). There was no such confidence in the fifteenth and sixteenth centuries. Then, a long string of battlefield victories indicated that the Muslim world, particularly the wealthy, populous, militant and expanding Ottoman Empire, had every chance of stretching its grasp to seize first Sicily or Vienna, then Naples and Rome, and finally all of western Europe. This was by no means an improbable, or even unlikely scenario. The sultan planned for it, sending his armies and fleets west. In response, the European powers fretted, drew themselves together in a sequence of Holy Leagues and prepared for the sultan's blows. Only the most powerful of Christian princes, 'his most Catholic majesty' the King of Spain, could direct his own sustained offensive east to match and meet the Turk. The battles of East versus West were of course fought along the shores of the Mediterranean and the banks of the Danube. But there were more exotic, farther flung points of conflict as well: the Renaissance struggle between Muslim and Christian European was the first truly global war. Portuguese exploration into the Indian Ocean in search of pepper, cloves and nutmeg (and also the fabled Eastern ally for the war against the Moors, 'Prester John', eventually identified as the black Christian king of the Ethiopian highlands) brought the age-old conflict of crusader and Ghazi to the monsoon-lands of Asia and East Africa. In 1498 Vasco da Gama made landfall in India. The Portuguese governors 'of India' (their brief actually included the whole of the Indian Ocean) who followed da Gama brought the customs of the Iberian Reconquista - fire and sword - to the work of carving out a maritime empire: this was no mere commercial creation. Afonso da Albuqerque seized Hormuz in 1509, Goa in 1510 and Malacca on the Malay Peninsula - gateway to the spice wealth of the East Indies - in 1511. These were all Muslim cities. Between 1503 and 1513 the Portuguese almost annually raided into the Red Sea; in 1517 they almost seized Jiddah, the very port of Mecca. The Mameluke sultan in Cairo (until 1517) and thereafter the Ottoman sultan had to respond to these provocations. In 1508 a Mameluke fleet co-operating with Indian Muslim rulers surprised the Portuguese at Chaul off the coast of India, but this Muslim-allied fleet was destroyed the following year. 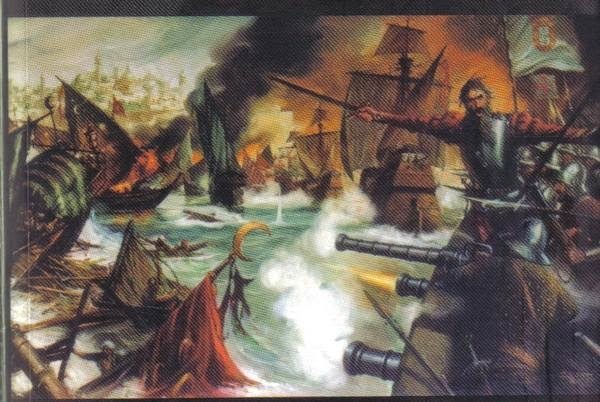 In 1538 a large Ottoman army landed at Diu in India, but failed to take the Portuguese city despite the support of a massive siege battery of 130 guns. 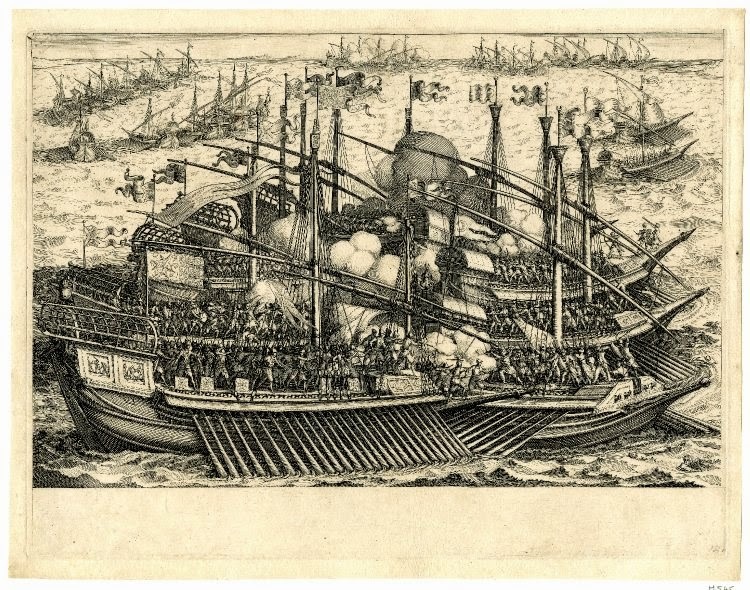 In 1552 the Ottomans attacked but failed to retake Hormuz; Portuguese counter-raids reached Basra in southern Iraq. In 1567 as many as forty Ottoman ships arrived at Sumatra to aid the Muslim sultan of Atjeh. Significantly this expedition coincided exactly with a peak in Ottoman activity against the Christian powers in the Mediterranean. This was indeed a world war. According to Herodotos (6.15.2), the 100 Chiot triremes at Lade in 494 BC each carried 40 picked hoplites serving as epibatai Herodotos (7.184.2) mentions that Persian triremes carried, in addition to native marines, 30 additional fighting men who were Persians, Medes or Sakai, the last of whom were a nomadic people of central Asia, highly valued for their archery skills. Every Persian ship was supplied by Persian subjects, including Phoenicians, Egyptians, Carians, Cypriots and Greeks, among others. The non-seafaring Persians supplied only admirals and marines. The last were probably on board to ensure the loyalty of the ship's company and for that reason they were undoubtedly carried in battle. One reason for the Athenian practice of taking only a few hoplites on deck to serve as marines was that the crew's pulling efficiency was seriously jeopardized if there were too many people moving about topside. Such movement inevitably caused the ship to roll. Under oar, therefore, the epibatai had to be seated (Thucydides 7.67.2), and the procedure appears to have been to keep them centred on the middle line of the ship. Once the vessel had stopped to board an enemy vessel, the epibatai would leap up to fight once the ships grappled. 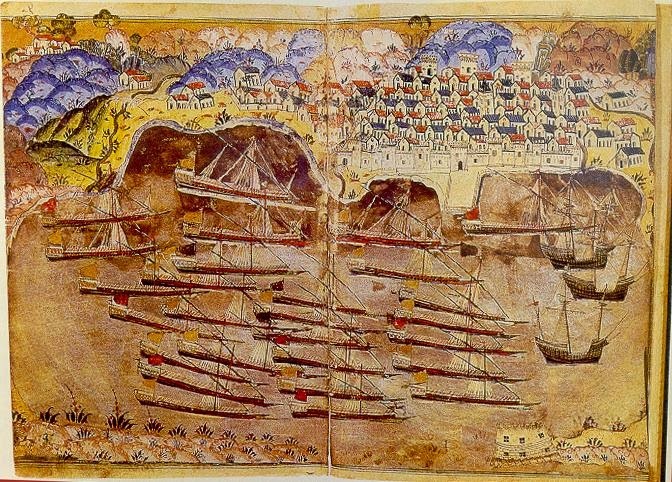 In his speech before the final sea battle in the Great Harbour at Syracuse, the Athenian commander Nikias revealed another reason: 'Many archers and javelineers will be on deck and a mass of hoplites, which we would not employ if we were fighting a battle in the open sea, because they would hinder us through the weight of the ships in exercising our skill.' 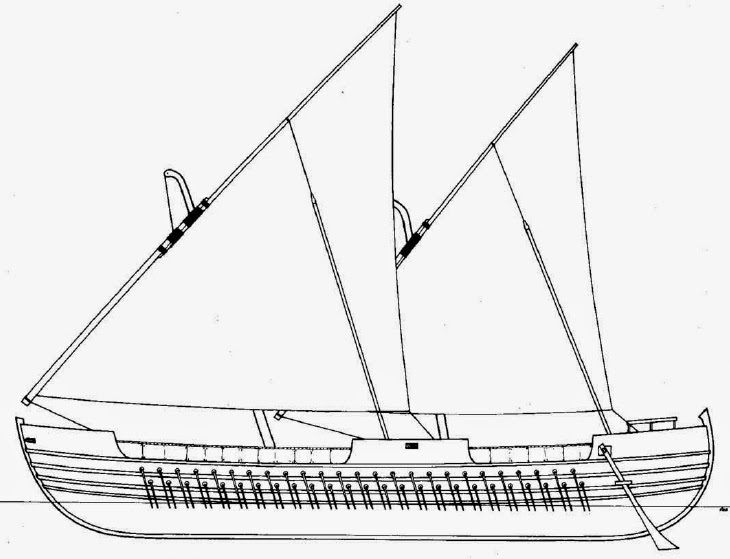 (Thucydides 7.62.2) Weight, particularly on deck, prevented the triremes doing what they did best, namely, conducting the tactical manoeuvres in which speed and agility were essential. The four toxotai were distinct from the ten epibatai, namely they were not carried on deck. An inscription (IG I2 950.137), dated to 412/411 BC, gives them a descriptive adjective, paredroi, meaning 'sitting beside'. It seems that they were posted in the stern beside the trierarchos and kubernetes and acted as their bodyguard in action. The helmsman would certainly have been vulnerable and would have needed protection, being too busy to defend himself. The Athenian playwright Euripides (Iphigenia among the Taurians 1377) talks of archers stationed in the stern, giving covering fire during an embarkation. Danish-Norwegian admiral. Born on 14 January 1516 in Lillö, Scania, Herluf Trolle was a nobleman and a scholar. He owned several large estates and had wide political influence as a member of the Danish State Council. In 1559, without any previous naval experience, he was appointed admiral of the fleet and inspector of the navy. Trolle threw himself into his work, and during 1560 he sailed with the fleet on maneuvers. He also encouraged construction of new ships. From the start of the Seven Years’ War of the North (1563–1570) he was commander in chief of the Danish-Norwegian navy. During 30–31 May 1564, a combined Danish-Lübeck fleet of 39 ships under his command met a Swedish fleet of 36 ships off Öland Island. After two days’ battle, the allies captured the Swedish flagship Makalös, the largest ship of the line at the time in Scandinavia; Swedish Admiral Jacob Bagge was taken prisoner. However, the ship blew up before she could be secured. On 14 August 1564, Trolle with 39 ships again met a Swedish fleet at Öland. This time it consisted of 28 ships commanded by Admiral Klas Horn. The battle was indecisive. That year Trolle issued one of the first known sets of fighting instructions, in which he stressed fighting by line-ahead tactics. On 1 June 1565, Trolle again met Klas Horn, this time at Fehmam. Horn had 40 ships and Trolle commanded an allied force of 32 Danish-Lübeck ships. The action was hotly contested but again indecisive. Trolle, however, was severely wounded and died on 25 June in Copenhagen. Briand de Crèvecoeur, E. Herluf Trolle: Kongens Admiral og Herlufholms Skoles Stifter. Copenhagen: C. A. Reitzels Forlag, 1959. During the sixteenth century the Portuguese, with their large Brazilian possessions, were dominant in the transatlantic slave trade. Speed at sea was essential, as the mortality rate in the slave hold was very high. Slave ships would moor in creeks on the West African coast in order to rendezvous with their agents in the grim trade. In turn these agents would acquire slaves inland, often from the winners of tribal conflicts where the losers were sold to the highest bidder. At this time there was no ban on slaving in Europe, but official licences were needed. Many captains did without them, as they were expensive to procure. This fast carrack was typical of the vessels involved in the trade, being longer and slimmer in line than a conventional cargo ship.